Liar & Spy, the forthcoming new novel from Rebecca Stead, is, in some ways, the complete opposite of When You Reach Me. When You Reach Me has a girl protagonist; Liar & Spy’s main character is a boy. 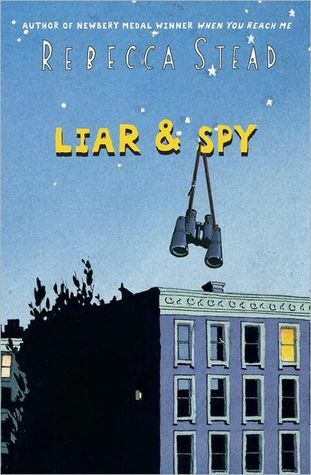 When You Reach Me involves science fiction and historical elements, Liar & Spy is completely contemporary and realistic. When You Reach Me has a pair of old friends who aren’t speaking; Liar & Spy has a pair of new friends just getting to know one another. The two books share one thing in common, however - both feature Rebecca Stead’s unmistakable writing style. Georges is named for his parents’ favorite artist, Georges Seurat, but most of the kids in his school don’t know that, so they tease him, calling him Gorgeous and generally bullying him until school becomes insufferable. Georges’s family has also just lost their house, and they have had to move into an apartment while his dad finds work and his mom works double shifts as a hospital nurse. Only one exciting thing has happened to Georges: meeting Safer and his sister, Candy. They live in Georges’s apartment building with their free-spirited parents and spend much of their time spying on their neighbors. One in particular, whom Safer calls Mr. X, is a frequent target, because Safer says he smuggles dead bodies out of the building in duffel bags. Georges is drawn immediately into the excitement of spying on a potential murderer, but as Safer becomes more and more reckless, Georges wonders just how far he will be asked to go toward exposing Mr. X’s supposed crimes. This book is so well-crafted that every character and every place the characters visit, including school, feels somehow magical. Stead chooses such strong, substantial details in her descriptions that the reader can’t help but visualize each sentence. I read this book over several days, riding the train to and from work. Each time I had to put the book down, I would look around dazedly, as though surprised to discover I was not actually living inside the world of the story. When I returned to the story each day, I could feel myself sliding back into the story with ease, eager to absorb every detail. There are some twists and turns to the plot, with two major mind-blowing reveals toward the end that cause the reader to really reevaluate his/her take on the entire story. Though twists are fun, the more impressive thing is the way in which the mood of the story shifts depending on how Georges is feeling. Georges sees things one way at the beginning of the book, but when his attitude shifts after the events of the story, the very same people and situations look totally different. That kind of subtlety is what sets Stead’s writing apart, and it’s what really pushed me over the edge from a four-star Goodreads rating to a five. I first tried reading my mother’s paperback copy of The Long Secret when I was a kid, and the subject matter and writing style both went right over my head and I pretty much wrote off the entire story. Back in February, when I read Shelf Discovery, I learned that this book was actually a pretty interesting, multi-layered work of fiction, and I decided that my adult brain could probably handle it. Though Shelf Discovery’s “book report” spoiled the ending for me (which I will not do for you here), I still got something out of reading this sequel to Harriet the Spy. It’s summer, and Harriet and her family are at their summer home, where Harriet spends much of her time palling around with Beth Ellen, whom she calls Mouse because she never stands up for herself or takes any risks. Though Harriet’s strong personality is ever-present, the story belongs to Beth Ellen, and to her difficulties dealing with her flaky mother who is in and out of her life, as well as other pitfalls of growing up. All summer long, Harriet drags Beth Ellen around with her, trying to use her detecting skills to figure out who is leaving mysterious, nasty notes all around town. I liked this book, but I have a harder time imagining a contemporary child who would like it. The language is very rich, and Fitzhugh’s style is so distinct it would be impossible to say this book is not well-written. However, the language is so adult and the layering of the story threads and themes so complicated, that I think it could be a hard sell. In fact, my library (which is in an affluent part of the city, where kids regularly request highly literary books) doesn’t even own a copy, and in 18 months, no one has ever asked me for it. I couldn’t tell if some of what seemed adult about the book was really just a product of the differences between adolescence during the 21st century and adolescence in the mid-1960s, or if Fitzhugh’s writing just has that tone of maturity, but either way, it might take awhile for a child reader to get used to the flow of the language. Thematically, I was surprised at how much the story touched on big life issues, like religion, puberty, menstruation, marriage, and feminism. In that sense, I really thought it compared well with Judy Blume books, as well as contemporary titles by Phyllis Reynolds Naylor (the Alice series) and Lauren Myracle (Ten, Eleven, Twelve, etc.). It was interesting to me how the concerns girls have about growing up both change and remain the same over time. 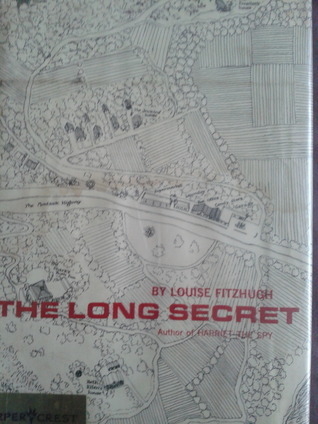 I’m really glad I read The Long Secret, and I think any girl who has ever held back her feelings or felt like a mouse will really relate to Beth Ellen and find themselves much more interested in befriending her than domineering, bewildering Harriet. Cara Landry’s teacher, Mr. Larson, was once named teacher of the year. These days, though, he is burned out and spends most of his days sitting at a desk with the newspaper and a cup of coffee, letting the kids in his class teach themselves whatever they might want to know. During one such unstructured school day Cara writes the first edition of The Landry News, her personal newspaper, in which she writes a scathing editorial about the lack of teaching in her classroom. The newspaper lights a fire under Mr. Larson, and eventually grows to become a class project that changes his outlook on teaching. 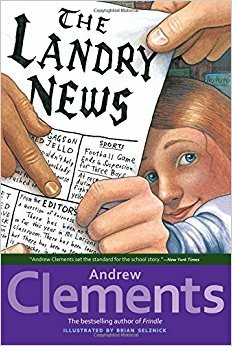 As he does in No Talking, Frindle, and Troublemaker, Andrew Clements creates a very vivid image of the school he writes about in this book. Within a very few pages, I could picture the messy, chaotic environment of Mr. Larson’s classroom, and his casual, bored demeanor as he sits at his desk. By including the principal’s point of view along with Mr. Larson’s and Cara’s, Clements gives the reader a complete view of the school and a great sense of where everyone fits in the grand scheme of things. I like that Clements is able to keep the school story genre fresh by spending time on these details in each of his books. The plot itself is pretty predictable, though there are some twists and turns on the way to the obvious ending. There is a bit of emotional mushiness that might make adult readers - especially teachers - a bit misty-eyed, but this is balanced out pretty well by the lessons the kids learn about freedom of the press, and by Cara’s own journey toward getting over her parents’ divorce. This book isn’t as funny as some of Clements’s other books, but it has a lot of heart, and it encourages kids to consider their teachers as people, not just authority figures. Recommend this book to Clements fans, and to readers who have enjoyed The Secret Life of Ms. Finkleman by Ben H. Winters, Because of Mr. Terupt by Rob Buyea, Nothing But the Truth by Avi, and Clementine’s Letter by Sara Pennypacker. 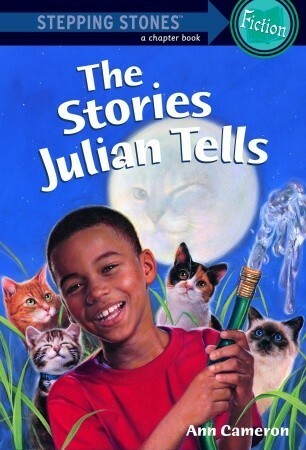 Julian is a young African-American boy with a talent for spinning yarns. Whether he’s making excuses for eating his mother’s pudding or convincing his little brother, Huey, that cats come from catalogs, he always has a great story to tell, and a dad who appreciates and cultivates his big imagination. My father is a big man with wild black hair. When he laughs, the sun laughs in the windowpanes. When he thinks, you can almost see his thoughts sitting on all the tables and chairs. When he is angry, me and my little brother, Huey, shiver to the bottom of our shoes. There are a lot of ways to tell a reader that a character’s father has a strong influence on him, and a strong presence, but this is by far the most appealing way I can imagine. It’s also a very accessible description, even though it’s not completely straightforward. Kids can recognize all of those words, and if they pause to consider them, they can decode the meaning of Cameron’s metaphors. Another great strength of this book is its dreamlike style of illustration. Julian’s imagination, and his dad’s, seem to consume each of the drawings, bringing elements of the adventures they invent right into their everyday lives. The visual cues provided by the illustrations also help kids to understand the more poetic tone of this book as compared with other early chapter books, which will give them a little more context for understanding Cameron’s style. This book is so skinny it often gets lost on my library shelves. Now that I’ve read it, I can’t wait to recommend it to my early chapter book readers - especially the boys who need something beyond Magic Tree House and Star Wars. Tina Carstairs is twelve years old, and considers herself a Sad Soul. She and her friends have even formed a club - the Saturday Sad Souls Club - devoted to the improvement of their most egregious flaws. But even though Tina has a twitch that flares up when she’s angry or anxious, that’s not the biggest of her problems. Her mother walked out on the family, moved away, and met a new man. Her father is planning to marry an overly sweet young woman named Rosebud. And Tina’s friends have invited a new girl into their club despite the fact that she doesn’t seem to have any flaws. The only thing that might save Tina’s summer from total disaster is Johann, a sixteen-year-old Dutch tourist she meets in New York City. The illustration on its front cover and even the blurb on the back of it reduce this book to a frivolous story about a misunderstood adolescent. I realized very early on in the story, however, that this book has much more depth than that. 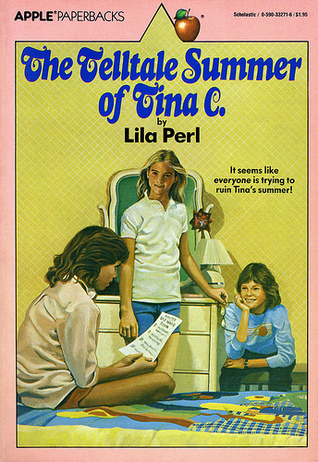 The Telltale Summer of Tina C. is a well-written slice-of-life story about growing up in the 1970s suburbs. Though Tina’s parents are divorced, she is troubled by the idea of blended families, and outright disturbed by the fact that her mother’s new boyfriend does the cooking, while she works all day. Though Tina has some angst - about her twitch and the boys who tease her for it - her life is pretty well sheltered until she has the opportunity to visit New York. The story arc really resembles a coming of age story more than anything else, and Tina is a well-developed, flawed, but lovable protagonist whose emotional experiences are more important than the individual points of the plot. As I read, I found myself wondering how a twelve-year-old girl of 1975 might react to certain things about this story. Would it seem unusual, or dangerous, for example, for a girl Tina’s age to spend time with a sixteen-year-old boy in a museum, without adult supervision? In 2012, parents would go nuts, I think, imagining all the ways in which an older boy might take advantage of a younger girl, but was society the same way back then? Or did parents feel safer? I also wondered if the underlying discomfort with divorce and remarriage reflected the author’s attitude, or Tina’s, and whether the average reader of this book would have felt the same sense of confusion and dread, or if she would take it in better stride. I really don’t think a book like this one could be published today. It’s so innocent, and I can imagine a 21st century twelve-year-old finding it tedious and slow-moving. On the other hand, it’s one of the best Apple paperbacks I’ve ever read, and kids who are weary of the darkness of contemporary YA might like to give it a shot. It’s out of print, but copies are available online. See more posts about this book at Cliquey Pizza: 80's teen book series & pop culture and New York Minknit. Kirkus’s original review from 1975 is also available here. 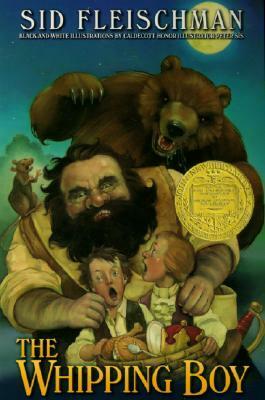 The Whipping Boy is a slim historical fiction novel that won the Newbery Medal back in 1987. It’s the story of Prince Horace, also called Prince Brat, who often misbehaves on purpose in order to see his whipping boy, Jemmy, get punished. When the prince runs away and Jemmy follows, they fall in with some criminals and must switch places in order to outsmart them and make their escape. Of all the relationships presented in children’s books, this one, between a prince and the boy who is punished daily on his behalf, is one of the most unusual and the most interesting. Though the story is mainly an adventure, following the two boys as they try to outsmart a pair of ne’er-do-wells, it also raises a lot of important questions about wealth, status, education, and justice. The prince is rich and powerful, but he has never learned to read or write because he is always busy misbehaving. The whipping boy, however, who can afford to take nothing for granted, has learned the lessons intended for the prince and is fully literate. Inside the castle, the prince’s crown gives him authority; outside the castle walls, Jemmy becomes the powerful one because he can read and write. When the boys trade places, it’s not just a cute Parent Trap-esque plot device. Instead, the swap is used to illustrate the mostly arbitrary societal constructs that separate the haves from the have-nots. The reader learns, without explicitly being taught, that there are different types of riches, and that the last can suddenly be first when circumstances shift and change. There are many other elements to this book that make it great. I’m sure kids are pleased to see Prince Brat get his comeuppance after Jemmy has endured so many beatings in his stead, but I bet they enjoy his journey toward redemption just as much. Each character the boys meet on their journey back to the castle is colorful and memorable, and the boys’ clever plan for finally escaping their captors makes for a very satisfying ending. This book reminds me a lot of The Tale of Despereaux, and I think fans of one will equally enjoy the other. It’s also a nice, quick read with lots of action that a reluctant reader might be willing to try over something longer and more intimidating. I like Sid Fleischman’s straightforward writing style, and though I saw the happy ending coming from the beginning, the road he took to get there was thoroughly enjoyable. Katie has read 5 books toward her goal of 400 books. Copyright 2017-2019 Katie Fitzgerald. Powered by Blogger.